60 Inch Center covers art happenings in the Portland area through writing, photography and curated links. Emily Endo, a multimedia artist based in Portland and Joshua Tree, has returned to the city of Portland for the opening of her solo show Immaterial at Bullseye Projects. Endo’s most recent works explore the materiality, purification and beautification of the body with cast glass and natural materials. 60 Inch Center contributor Lindsay Costello interviewed the artist to learn more about her influences, modes of material research, and themes of transcendence in the exhibition. possess an otherworldly quality. Your show title, Immaterial, seems to address this duality. Can you describe the reasoning behind the title of your show? EE: The show title speaks to the idea of transcending the body, and how beautification and purification processes, for instance scenting and bathing, are efforts to exalt the body while also transcending it. I’m interested in that duality, and the idea of “washing away” the materiality of the body. I’m also considering skin as a permeable membrane, so in several pieces I investigate how bodily fluids can seep through the skin, thus traversing a barrier. For instance, in Transpiration, a cast glass head is drilled with holes emulating facial pores. The liquid seeping through the pores is scented to smell like salt. The word transpiration relates to perspiration; it’s also a botanical term describing the process of water evaporation from plant leaves. LC: Your work is permeated with aquatic symbols like seashells, juices, aquarium pumps, and scented water. Several pieces are rendered in cool tones, and the viewer hears dripping and pumping sounds while moving through the gallery. Why do you utilize this combination of watery imagery and sensory experience in your work? specifically Roman and Ancient Greek representations of the female body. I looked at images of Aphrodite, Venus, and other figures representing an idealized body. Simultaneously, I considered the fragmented body and the body as a symbol. These considerations led me to seashells as a stand-in for female genitalia, depictions of Venus on the half shell, and other representations of goddesses on shells. My move to Joshua Tree has deeply impacted my attitude toward water. Living in the desert, water becomes precious. I spend a lot of time monitoring water; in my studio I maintain a catch-water system for my garden. I grew up in San Diego, so being closer to my hometown, I also think more about my childhood in a beach city and its connection to the fantasy of water. Most of my childhood fantasies revolved around water — mermaids, pool parties, fountains, abundance. So, I’ve been playing with the back-and-forth of contained water systems and the luxury and fantasy of water. Finally, I’ve been thinking about bodily fluids in relation to the interior and exterior body. Fluids can be detoxifying and purifying, but we also have the urge to wash them away. Scenting the water relates to bathing. I looked to historical and modern bathing traditions from all over the world as references. exaggerated up close. You use both natural and synthetic scents in several pieces. How did you come to incorporate scent into your practice? Where do you see this medium taking you next? EE: I first became interested in scent when researching bathing and purification processes in the ancient world; I looked at the uses of perfume and incense in ancient Egypt, Greece and Rome. In almost all of my work, I pull in a combination of natural and synthetic materials. Part of that choice is driven by the world we live in, which constantly integrates these materials, but I’m also interested in cartoonish, childlike symbols of smell. Humans are quite perceptive of synthetic smells. It’s more difficult for us to process natural smells, because we don’t encounter them as frequently. In Immaterial I used synthetic scents so viewers could identify them, as well as natural scents, which increased the depth of the smells. I like that the viewer is invited to get closer to a piece in order to smell it. Like a scented body, it’s intriguing. There’s a moment of intimacy there. As my next step I’m starting a fragrance company, launching in late summer or early fall, called Out of Range. I’m excited to make scents, and then make sculptures that respond to them. reference mythology. There are also several pieces with the word “lunar” in the title. Can you expand on your interest in mythology and the natural world? Recently, I’ve been thinking about my own body as somewhat alien. Living in a body is an isolating experience, since we don’t always know what’s happening inside our bodies. A few years ago, I was inspired by a traveling exhibition curated by Astria Suparak and Ceci Moss called Alien She, which was displayed at the Museum of Contemporary Craft. The exhibition’s title is a reference to a Bikini Kill song of the same name. The song challenges normalized gender roles and explores the journey toward a collective feminist consciousness. LC: In several sculptures, female busts are adorned with piercings and flowing wigs, calling to mind your earlier works of cast glass horse heads with acrylic hair. These decisions again emphasize your consideration of transformation. Can you elaborate on your interest in metamorphosis and transcendence as it relates to the body? What sparks your interest in feminine adornment and body modification? EE: I’m interested in the desire to change the body; to become immaterial by addressing the materiality of the body. I look at piercings and corporeal self-expression as examples of this, so I incorporated piercings into my Lunar Child cast glass heads, which have metal studs in their faces. Visions of what it means to have an adult body are strong during adolescence. The wigs and hair extensions I use in these works are also a nod to adolescent self-expression, but more so to female beauty in general. Hair has always been a signifier of identity, gender, class, race —it’s a very political medium and a symbol of femininity. Hair is so often used to express persona. In these pieces, I utilized the hair I wanted as a child. It’s doll-like and cartoonish. All of my work contains metamorphosis. For the last decade, I’ve been investigating the ways in which change is translated into stories. 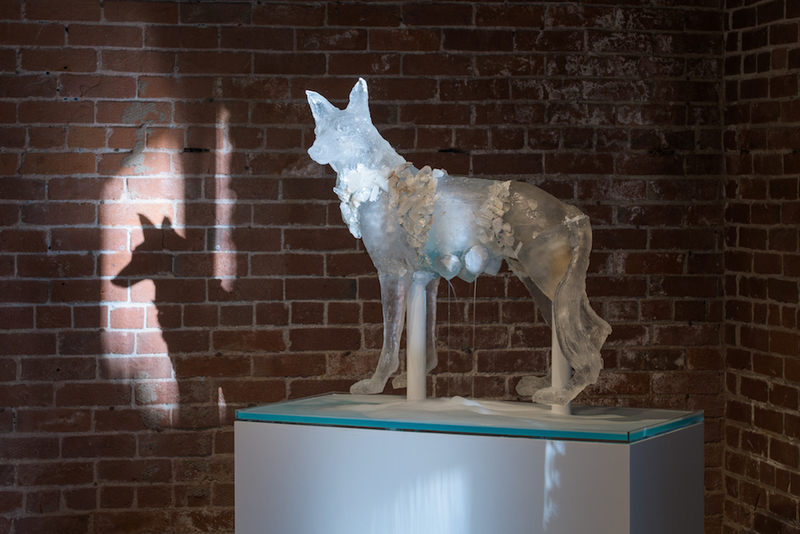 In She-Wolf, the quartz crystals embedded in the wolf figure are reminiscent of how sculptures can change over time. Archaeologists have found ancient bronze sculptures on sea floors covered in barnacles. isn’t included in this exhibition. 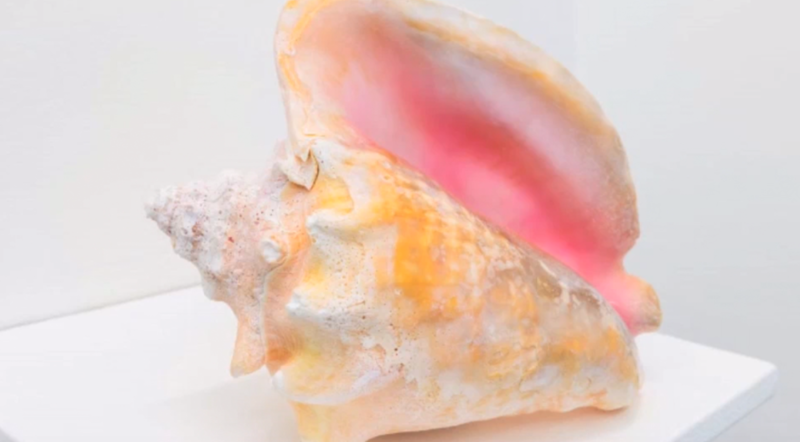 Singing Shell, a conch shell embedded with an Arduino speaker and a proximity sensor, projected an edited version of “Angel Baby” by Rosie and the Originals. The piece evoked the spirit of young love and adolescent hope. What was the process behind the creation of this piece? How did you select the source music? EE: I love “Angel Baby”, which was written by Rosie Hamlin, a Chicana singer, when she was just fourteen. She was born in Oregon and later moved to San Diego to record music. Adolescent longing and desire is illustrated in the song, and there’s something sort of trapped about it; being projected from a conch shell, it has an echoing sound. I worked with Derek Monypeny to distort the song, because I wanted it to sound like a mermaid was singing it. Again, referencing cartoons and bubbly ultra-femininity, the idea that you could call someone on a “shell-phone” was appealing. I love the childhood fantasy contained there, and the materiality found in the space between real and fantasy. I loved collaging as a child. LC: You recently moved to Joshua Tree. What is your new project, the High Desert Observatory, all about? How has the move impacted your work and sources of inspiration? Does site factor into your material decisions? EE: The High Desert Observatory is a studio and classroom that my partner Michael Endo and I are building at our home. It’s in the beginning stages now, but we have a gutted house that we are rebuilding along with other studio buildings on the property. We plan to start workshops in the fall on subjects like textiles and aromatics. Our neighbors, Heidi Schwegler and Derek Monypeny, are developing a space a mile from the Observatory called the Yucca Valley Material Lab, which will become a glass studio and artist residency. We’ve teamed up with them to share resources. Michael and I relocated Dust to Dust, our curatorial project, from Portland to Joshua Tree. We’re hoping to rebuild it in a shipping container on our property, but in the meantime we’re doing some pop-ups around town. Moving to Joshua Tree has influenced my work more than I expected. I live in a rural area that is very quiet. I’ve become more attuned to sound, smell, and light. I’ve started bringing some desert references to my artwork; She-Wolf is actually based on a coyote. I’ve been making rattlesnake pieces as well, which I didn’t expect to blend with my ethereal, pastel aesthetic, but it does! I’m simply inserting new symbols. So much of Immaterial is about bodily fluids, so I began thinking about snake venom and snake goddesses as well. I’ve always loved rocks and minerals, which I now have all over my property in Joshua Tree. Beginning to incorporate these into my work has opened up some freedom to collage material elements. A lot of the rocks in this show I pulled directly from my yard. Being in a more rural environment has also made me consider community further. In Joshua Tree, you think differently about friends and neighbors. You become even closer, and share resources more. LC: This location of Bullseye Projects is closing in June, with plans to relocate to southeast Portland, closer to Bullseye’s research and education department. What has your experience with a gallery in transition been like? What’s next for you? EE: Working with Bullseye has always been phenomenal. They’re so supportive of artists, and since this location is closing, there’s been a sense of freedom to experiment. The staff are warm, helpful and excited about continuing to support artists. In conversations with gallery staff here, they’ve seemed almost reinvigorated about their work. I’m developing the fragrance company I mentioned earlier, and I also want to start a new series of work about scent production, with sculptural distillers that explore the ways to capture scent. I’m interested in enfleurage, a process using fat to trap and extract scent from delicate flowers. I distill plants back in Joshua Tree, and will be teaching about that process this summer at Pilchuck Glass School. Again, the idea of metamorphosis arises — a raw material becomes a new extraction. Finally, I want to start a snow cone company! It will be informed by my research on water and scent. I’m planning a snow cone pop-up at High Desert Test Sites in Joshua Tree. In continuation of my research into the alien body, I’m also curating a show with Dust to Dust about aliens. So right now, I’m interested in the conceptual possibilities of scent. And aliens. And snow cones. Immaterial is on view through June 1, 2019 at Bullseye Projects. For more on Emily Endo, visit http://www.emilyendo.com. Images courtesy of the artist and Bullseye Projects. Exhibition photography by Mario Gallucci.